The Paladin Weapon Master Mouse is the District Boss of the Templar's Sanctum in Zokor. It is known to drop Ancient Relic, Infused Plate, and Plates of Fealty. The Paladin Weapon Master Mouse prefers Glowing Gruyere, but can be attracted with Standard Cheeses. Forgotten weapons are very effective against the Paladin Weapon Master Mouse. Arcane weapons are of normal effectiveness. The Paladin Weapon Master Mouse can be found only in the Templar's Sanctum after 20 other mice have been captured. The Paladin Weapon Master Mouse can only be captured once per visit to the Templar's Sanctum. Ancient Relic, Infused Plate, Plates of Fealty and Climbing Boots of Fealty. The Paladin Weapon Master Mouse drops the Zokor Fealty Egg during the annual Spring Egg Hunt. 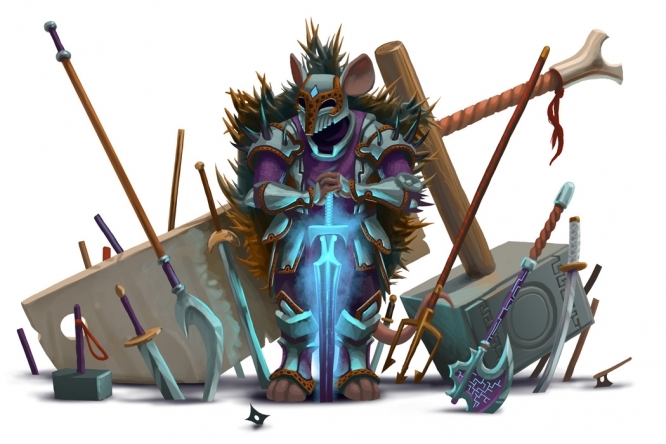 9 September 2015: The Paladin Weapon Master Mouse was introduced as part of the Hollow Heights release. 29 August 2017: The Paladin Weapon Master Mouse began dropping Climbing Boots of Fealty in preparation for the release of Moussu Picchu.